There was so much produce in our box this week that I had trouble fitting it all in a photo...which is not such a terrible problem to have, especially since our grocery bill for the week was much lower. 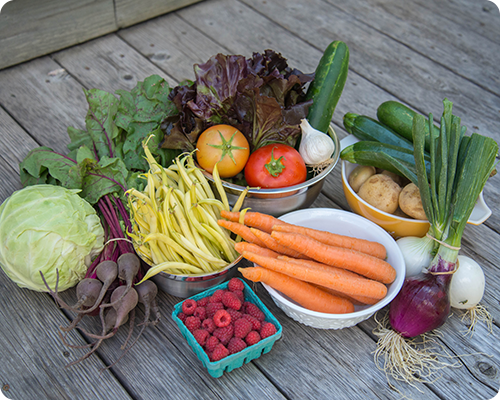 In this week's box we received: cabbage, beets, red leaf lettuce, cucumber, tomatoes, garlic, potatoes, zucchini, onions, beans, carrots and raspberries. 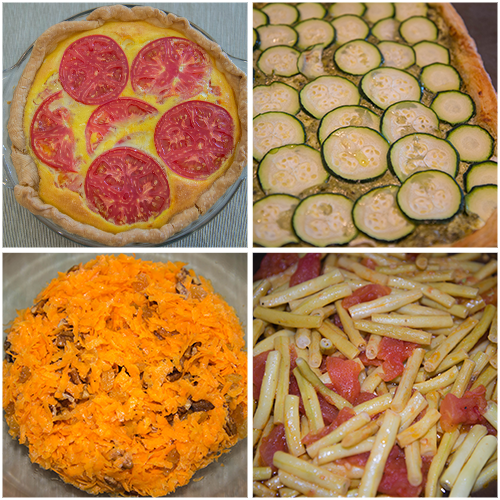 Tomato Parmesan Quiche - a simple and tasty dinner, delicious served with a salad (recipe courtesy of The Forest Feast). Zucchini Pesto Tart - this is a favorite family (recipe from The Forest Feast cookbook). Carrot Slaw - simple and delicious (recipe courtesy of The Forest Feast cookbook) and it keeps well in the fridge for a couple of days. I made it on the weekend and we will have it for lunch several days this week. With the cabbage, I made the same cabbage steaks as last week. This was one of those recipes that I was a little hesitant to try - it is a little unusual - but I am happy to say that everyone likes them. I roasted the beets, the potatoes and the zucchini. And I chopped the onions and froze them for later; there have been so many onions over the last few weeks that I am not sure what else to do with them.